Two important deadlines are beginning to loom large as the year progresses: (1) finishing the work for my honours degree, and (2) applying for grad school. I'm mainly writing this down just to get my thoughts/plans all straightened out. But any feedback or advice would be a welcome bonus. (B) 5000 word essay on effectively any topic [due end of Oct.]. I quite like the idea of further exploring the sort of meta-ontological deflationist picture I outlined here. Or else perhaps some political theory -- especially deliberative democracy or Benkler's work on "peer production" [cf. (d) below]. I might also sit in on some philosophy of mind lectures, and see if anything there captures my attention. (C) 10-15k word sub-thesis. [Due mid October.] This is on the link between apriority and necessity. I've been slowly narrowing down exactly what it'll cover, and am just getting starting on actually writing it now. The first chapter will be mere exposition, outlining Kripke's arguments for the necessary a posteriori, and the Chalmers-Jackson response from 2-D semantics. (The sort of stuff I discussed here.) The second chapter might look at the challenge from nomological necessitarianism (which attempts to collapse metaphysical possibility down to the nomological space), with reference to Bird's and Shoemaker's arguments. From what I've skimmed of them so far, they look fairly Kripkean, and so should be vulnerable to a similar 2-D response. For something a bit more original, I might also address the world-essentialist claim that our world couldn't have had different laws. Could be fun. Finally, in the third chapter I'll discuss the objection from "strong necessities" or primitive modality, and see whether my reconciliation strategy pans out. a) Metaphilosophy: conceptual analysis, the reliability of intuitions, how substantive a priori knowledge is possible. c) Ethics: Perhaps "welfarism" would make a nice umbrella topic here, letting me pursue both issues about welfare/harm (which I've blogged about quite a lot recently), as well as interesting questions about whether there are other fundamental values besides welfare. e) CogSci: (i) "neuroethics" is a nice mix of fields. Brings up interesting issues about moral responsibility and such. Alternatively: (ii) AI is always fun to think about. (iii) Can cognitive science shed any light on a priori reasoning? f) Metaphysics /philosophy of science: the idea of "levels of explanation" (say, between the micro and macro realms, physics vs. social science, neuroscience vs. psychology, etc.) is an interesting one which I'd like to know more about. Also, questions of whether, say, chairs or the atoms that comprise them are more "fundamentally" real. Dennett's 'Real Patterns', etc. The first three are perhaps the most serious contenders at present, though it's all very speculative at this stage. The biggest difference is between ANU and all the rest. American grad schools have an extra 2 years of coursework, which I think is a big advantage given my broad interests, current indecision, and unconscionable ignorance of both philosophy of science and history of philosophy. The extra teaching opportunities would be a plus, and exposure to a different philosophical climate might be an eye-opener (shifting to ANU from Canterbury certainly has been!). Overall, I'd guess that graduate education from a top U.S. school would probably help me become a more well-rounded philosopher. I also hear that their degrees are generally favoured on the job market. On the other hand, the sheer level of philosophical activity here, and the general atmosphere for grad students, is reputed to be pretty hard to beat. Especially if I want to write about conceptual analysis, this would seem the ideal place, with Chalmers and Jackson both here. Another student recommended taking a year off midway through the degree to teach (adjunct?) in a U.S. department, which might ameliorate some of the disadvantages mentioned earlier. Pittsburgh has a great reputation; I would definitely consider it. 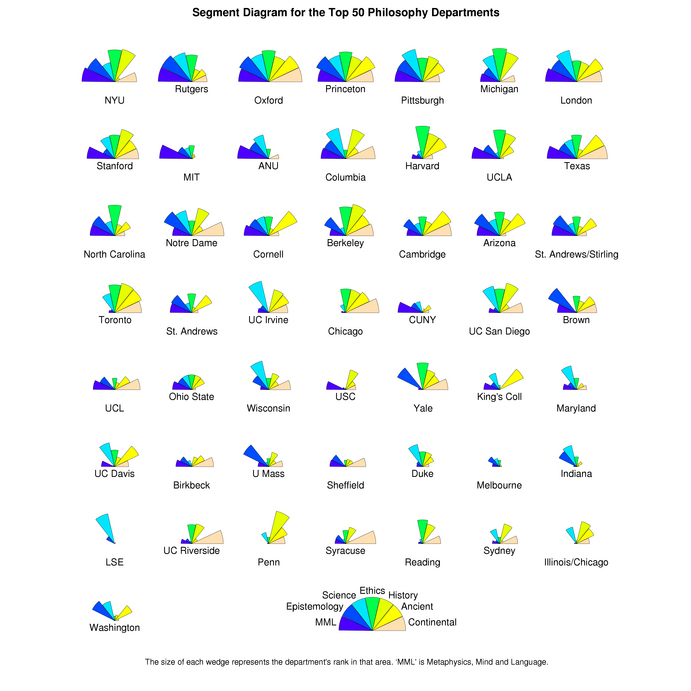 But my evaluation may be skewed by the fact that there are a lot of connections between Toronto and Pittsburgh. I can't help but point out that Toronto is usually considered the largest philosophy department in the English-speaking world, they have an excellent financial program for financial aid and development of graduate students, and they are always looking for a few good Australasians. It also has become a very good department for analytic. You can see the active faculty list here. Just a brief sample of the diversity: Hurka and Sumner do work on sophisticated forms of utilitarianism; Jennifer Nagel does work on a priori knowledge; Brown does work on scientific realism; Sreenivasan does some of the things you list under 'political philosophy' (and the philosophy department has a thriving partnership with the law school for grad students interested in issues like these). Cog Sci might be a little weak, though, although there are people still active (like De Sousa) who have done some work in it. The faculty does an excellent job of being accessible, but because it's such a huge department, there's a lot of flexibility (that's why I went, and it didn't disappoint). All grad students get teaching experience. The colloquia and lectures they get are top-notch names from around the world. So it's a Canadian university you might want at least to look at. You will be helped on your decisions if you scan my blog at http://georgeshollenberger.blogspot.com/. There I am teaching on my new and very different book on The First Scientific Proof of God. I am out of Johns Hopkins, am retired, but still very active in science. People at you age can lead all nations into a very new and beautiful world. So, keep your mind open to all fields of thought. what areas of phil. are you interested in? Anon - mostly the ones mentioned in the post, esp. ethics and metaphysics. Brandon - thanks for the pointer. The advice I sometimes get, as an honours student thinking about further study, is to forget about thought and study for a while and go and do something else, like trekking through India or working with your hands in cold places for little pay, or going to Hungary and trying to learn the language, or discussing metaphysics with working class drunks in Liverpool, and generally discovering just how many things there are to examine if one wishes to lead an "examined life", in the fullest sense of the phrase. I am inclined to agree with this advice; but that is quite a personal inclination, I suppose. oops. sorry. that's what I get for not expanding the post. Having spent the last two weeks with current Oxford students, staff and former Oxfordians... (First at a conference in Dublin, then at a conference in Oxford) I might be able to help on the Oxford front. My general impression is that Oxford is very much what you make of it. It certainly has a lot of good people in certain areas, and if you chose to take them you will get plenty of good opportunities to get on 'inside' tracks there. Likewise Oxford is a solid degree in terms of job placements as you might expect. That said Oxford itself is an excellent place, and I prefer to be UK based than US based so that is something in its favour. And you do know at least one person there already Neil Levy has recently accepted a half of the year post there. As general advice, you need to start deciding where you want to end up, and what you want to be doing and focusing on since this should really guide where you do your PhD. I mean are you heading back to NZ? (If so I get the impression that UK degrees are vaguely prefered to US) Or to Australia? Or do you want a post at a top 20 University? And where? US or UK? Good luck with the decision, it seems only yesterday that you were deciding on ANU! Mike b. wrote: "or discussing metaphysics with working class drunks in Liverpool". I've had many a deep conversation on the nature of consciousness, cognitive science and related topics in visits to Liverpool's bars. I suspect it's the Irish influence there. "But I figure making it into a top-tier school would open the most options, right?" This seems sensible enough. I'd try and not catch the top-tier disease though, by which I mean the view that only working at the top tier universities is really worthwhile. I have several friends who are unhappy, not because they don't have a life that most would envy, but instead because they feel that they should be working at a 'better' university. 1. Locate yourself somewhere currentish that you think is interesting and you think you can do worthwhile work in. 2. If you can work on something which is geniunely a cross over area this might be useful. (ie free will allows you to sell yourself as a metaphysican or a moral philosopher depending on the job. Likewise things like political theory do allow you to look for jobs in politics departments as well. That said, there is something to be said for specialisation, namely jack of all trades = master of none. 3. If you aren't already then start submiting some papers to journals! Publishing is the most important determining factor in the hireability of a philosopher, much more important than where you are trained. If this is too scary then get some practise by doing some reviews or work on a joint paper with someone. Yeah, "top tier disease" is definitely a risk to look out for. It's so easy to internalize the values assumed in one's corner of academia, even when - on reflection - you wouldn't really want to endorse them at all. Tricky, that.